Rhiannon Dwane is the next rider to feature in our Champion Born to Shine on the Centre Line series. Rhiannon and Got the Life from Australia placed 2nd in the Intro Open BD Online Associated Championships 2018. I started riding at a riding school when I was 11 as I hated team sports. I love to restore doll houses in my spare time. Got the life Age is a 13 year old bay standardbred. Jimmy was an ex trotter who had been started under saddle. 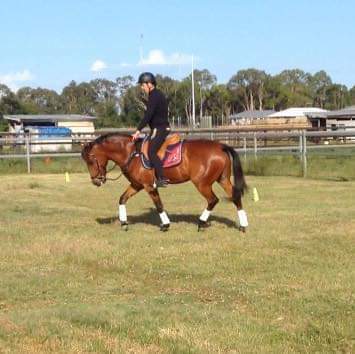 When I was looking for a horse one of my closest friends said she had the perfect horse for me but I was sceptical as I had only had warmbloods for dressage in the past. Jimmy did not want to be a race horse so he ended up with me. We always laugh as his race name was Got the Life and he certainly has got the life now! Jimmy will raid my hand bag for liquorice, he will take everything out one by one and neatly put it beside my bag then when he finds the liquorice he rips the bags to shreds to get to it. My goal was to qualify for the Associated Championship and we did! I ride with alot of fear so conquering my nerves each ride can be tough for me. Probably competing in the Associated Championships! How did you first hear about competing with Dressage Anywhere? I Googled it! People don't expect a horse with his breeding to do dressage so I didn't find comments very helpful at local shows. Competing online where no one knows his breed works for me. The judges! Every single judge whether or not I have been given an amazing score or not has been so fair and really taken the trouble to write down improvements to help us. Alison Duck and Kim Ratcliffe especially always have super helpful comments.